While such stunts certainly underlie the significance of our habits, there’s a more sinister implication too: our consumption and manufacturing practices. Nonchalant treatment of toilet paper makes sense. Not only is it meant to be disposable, but used loo paper is often covered in feces or other bodily splendors. However, origins and use matter a ton for our environment and our economy. The national market is still rife with virgin pulp toilet paper. Making matters worse is 2010’s policy of permitting Chinese and Indonesian imported toilet paper that’s 45% cheaper than Australian manufactured brands. Australian manufacturers’ natural response is quite obvious: cut costs and slash prices. Aside from importing Asiatic pulp, manufacturers are also disregarding more costly methods, including the use of recyclables. That means more reckless clear cutting of native forests throughout the country, a big deal given rapid deforestation. After all, the time required to digest and expunge is far less than that needed to grow a tree. Not all is negative however. Some progress is being made. Perhaps more due to digitalization than conservation, we are using less paper than before. A case-in-point is the Australian Conservation Fund, which managed to consume a whopping 28% less paper in 2011/12 compared to 2009/10, or from 256,121 A4 sheetsto 184,783. While great, such a declineis overall usage. Toilet paper, if anything, remains consistent with the population. One popular explanation is safety concerns. Conscious consumers and the logging industry are both quick to point out that recycled paper is rife with BPA and BPS, known for inhibiting estrogenic glands. Such chemicals are easily absorbed through the skin, so wiping with recycled paper can seem an assuredly bad idea. However, what people fail to mention is that near all paper products contain BPA and BPS, from currency to concert tickets. In other words, BPA and BPS exposure is inescapable. While hardly the poster-boy for reputable ecological practices, Australian logging companies are still under worlds more scrutiny than those in Indonesia and China, which known for laying waste to endangered and irreplaceable habitats. The only problem is that pulp can also be imported for manufacturing. 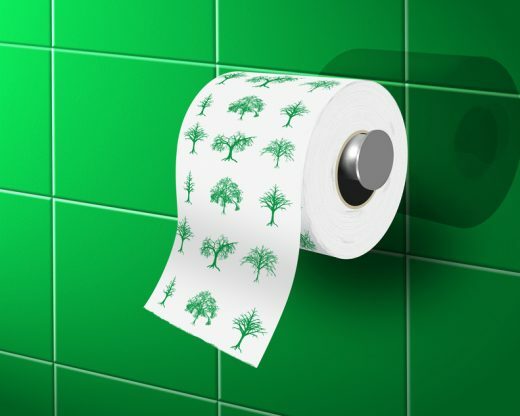 More stores are stocking recyclable loo paper thanks to the greater public interest. However, not all stores are, and not all stores are stocking the right brands. Those who can’t find what they’re seeking can go online. Tony Dunning is a full time writer and parttime comedian. He is currently employed Toiletpaperplus.com.au as a writer. He lives in Sydney Australia and is passionate about the environment and social justice.